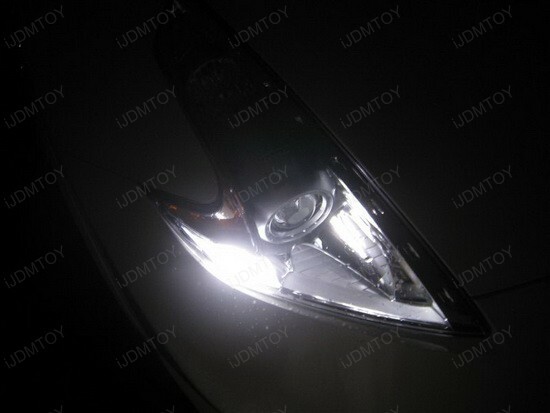 The picture showed our LED parking lights installed on 2009 Nissan 370Z with these high power T10 LED bulbs. Can you see the big difference between the stock bulbs and our high power LED? These high power T10 LED bulbs will replace stock bulb 2825 2827 168 194 W5W also fit all 2009 2010 2011 2012 Nissan 370Z, and these kinds of LED bulbs can light up as bright as HID headlights. With its plug and play set up, installing this high power LED parking lights (position lights or clearance lights) will be very easy and look good in any car. This entry was posted in - LED & HID Updates, Nissan and tagged 168, 194, 2825, 2827, high power led, LED clearance lights, led lights, LED parking lights, LED position lights, Nissan 370Z LED parking lights, T10 LED Bulbs, W5W by Eric Wu. Bookmark the permalink.